My 18th giveaway is a hamper of top quality store cupboard ingredients. If you haven't come across Cooks & Co yet, then I am pleased to introduce you. If you are looking for the best quality ingredients for your recipes then you need look no further. "We began back in 2003, as a team of specialist food importers with over 65 years of experience in seeking out interesting ingredients that we thought you’d all love. Cooks&Co is part of the family-owned business RH Amar, which has been importing fine food from around the globe since 1945. 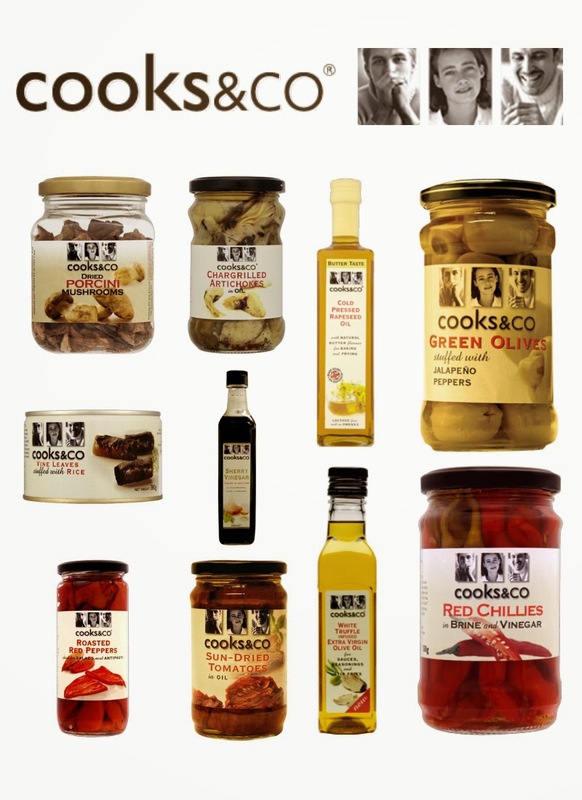 With such a longstanding foodie pedigree we’ve earned an enviable reputation for ingredients of the very highest quality"
I can personally say that the red peppers and artichokes are the best I have ever tried and I never buy any other brand. The red peppers are so tasty and succulent. Delicious! I also highly recommend the butter flavoured rapeseed oil. It really does taste like butter. It's crazy as it's just made from the rapeseed kernel and has no dairy in it. It's a great substitute for vegans and I have used it successfully in my baking too. To enter this giveaway just leave a comment and enter using the rafflecopter prize below. This giveaway is UK only and runs until 3 January 2014. The winner is announced on 4 January 2014. Disclosure: Cooks & Co kindly sent me a few products to try, even though I have tried some of their range before, they are also offering up the prize for one lucky winner. I was not required to write a positive review and any opinions expressed are my own. Great to add a bit of Mediterranean sunshine on our bleak winters days! Stuffed vine leaves are lovely. Thanks for the giveaway. Love Italian food - this would really help! I may faint with all the amazing giveaways you have on at the moment - fabulous darling! What a prize! Thank you! love to win! thanks for the great prize! not the usual sort of thing that finds its way into my weekly shopping basket! I love these products, so yummy!! This selection looks brilliant, especially for someone who likes to keep dairy intake to a minimum. That hamper looks great Jacqueline, I love every single one of those jars! Lovely prize, would put it all over a pizza! Lovely giveaways, wonderful quality but really glad they helped me find the the blog too! amazing competitions thank you merry Christmas! Love the roasted red peppers, great to make a pepper and feta cheese tart. Lots of ideas here for trying new recipes! Everything I love is in this hamper - perfect! That all looks great! Thanks! Have a great week! What a super yummy prize!!! Fingers crossed! What a super yummy prize - delicious!!! All teh things in teh hamper look delightful. What a haul! Looks tantalizing. Ohhhh I loooooove roasted red peppers! 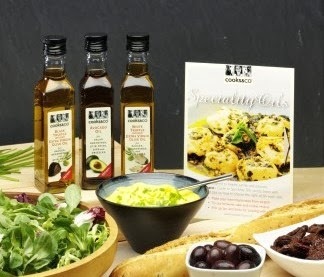 I've never heard of this company before, but all their products sound amazing - especially the rapeseed oil! I love vegan cookery and that sounds so useful! Lovely hamper, so many goodies to try! 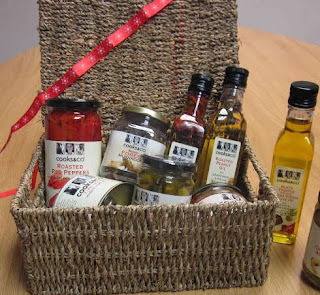 Lovely hamper, so many bits to try! What a great prize. I love food, as I am sure many other people do also. Artichokes! Everything looks lovely - but I really love artichokes! What a lovely prize. Thank you. Looks wonderful! Love those red peppers. Thoughtful prize for this time of year. That would be dinner sorted for a few days! I'd love to try the white truffle oil! mmmm what a lovely prize! great prize - thank you. That truffle oil would be fun to play with! This is my idea of the perfect hamper, fingers crossed and wishing hard. Some really yummy stuff here! Ooh, my kind of food! Looks like a great prize. thanks for the hard work. you could do so many mazing thing with these ingreditnets! Perfect selection of goodies for Christmas! Wonderful hamper prize, lots of lovely food! Wow. My other half would have fun in the kitchen with this lot. Many of my favourite things which are only ever bought as a treat. This is a gorgeous looking prize. Ooo, white truffle oil... gorgeous! Hmmm those red peppers are a handy thing to have in the cupboard at all times - so tasty and timesaving! Olives and jalapeños - yes please!! Ooh! I must try the butter flavoured rapeseed oil! I've been using rapeseed for years, but I've not come across this, it sounds amazing! Lovely - hampers are always welcome! Yum yum my kind of food! Only tried my first olive last year at the age of 30, totally addicted now, making up for lost time! Nice prize to win before Christmas. Some fab ingredients there to encourage my creative side. This is a lovely prize for whoever wins it. My daughter has just started cooking 'from scratch' (new baby) etc... I would treat her with this fabulous hamper. This would be a treat. This hamper with a bit of cheese and fresh crusty bread is a real feast. some awesome products in there that I need to try! perfect for me and my little boy luigi!